This is a question our benefits department receives quite often. For most it can be quite confusing. The short simple answer is a copay is usually a set dollar amount and coinsurance is a percentage of the cost. Let me explain. Copay’s or copayment’s are fixed dollar amounts you pay for covered health care. These are usually charged when you receive the service. For example you pay a set $20 when you visit your primary care doctor. Coinsurance is your share of the costs of a covered service. It is calculated as a percent of the allowed amount for the service. For example, if the plans allowed amount for an overnight hospital stay is $1,000, your coinsurance payment of 20% would be $200. This may change if you haven’t met your deductible. 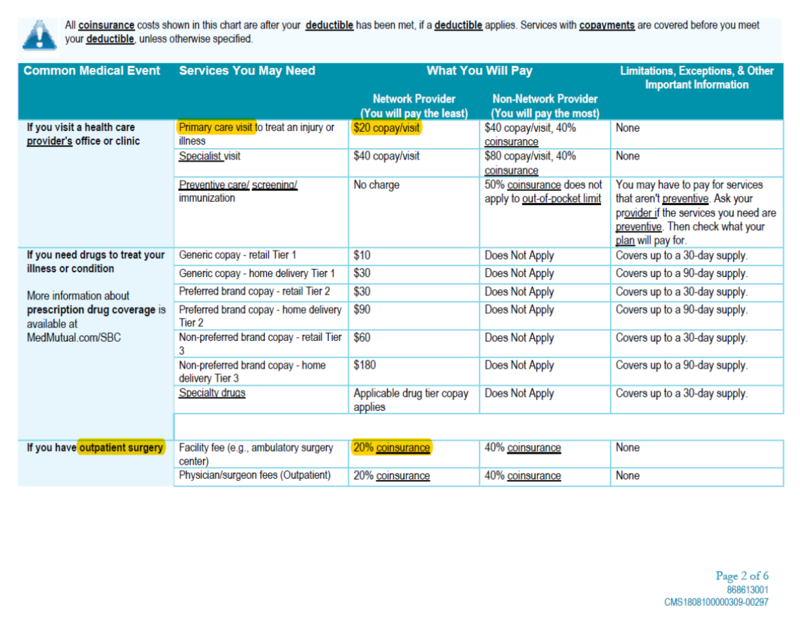 The below image from a Summary of Benefits and Coverage shows you example of the listings for copay and coinsurance. How Will Confusing Copay and Coinsurance Cost Me? Depending on your plan, you could find yourself in a situation where you pay extra money because you choose the wrong type of provider. Say your plan has a $100 copay for a Urgent Care visit but if you go to the Emergency Room your plan has a 20% coinsurance cost. You just have strep throat and not a life threatening situation. The Urgent Care will cost you $100 but the Emergency room will be 20% of the total cost. I don’t know if you’ve been to the Emergency Room lately but most of the times just to walk in is about $1000! That alone has you at $200 ($1000 x 20% = $200). Just by choosing a different type of facility you overspent. But by understanding your benefits can help. (The above are strictly fictional numbers, but you get the idea). Health Insurance can be confusing especially if your new to handling your own coverage or have never taken the time to read up on the definitions. Copay and coinsurance are just the tip of the iceberg so to speak. But don’t fret, we are available to answer any questions you may have. Give our benefits department a call today with any questions you may have. You can also view the below blog post that goes into more detail on other health insurance benefit definitions. Do You Understand The Insurance Benefits Offered By Employers?